A true-to-life biopic about the rise to fame of the rap group N.W.A that revolutionized the world of music in the mid-80's. Like many bands, N.W.A. (and, if you don't know what those initials stand for, I will let you click on the link to find out - I ain't sayin it) started out with a group of friends writing songs and making music together in a garage in the late 80's. Here the garage is in the mean streets of Compton, California, where young black men are routinely harassed by the police and confronted daily with the harsh realities of poverty, gangs and discrimination. With what's been going on in this country of late, this film seems particularly relevant. Some things never change. Out of that culture came rage and out of that rage came N.W.A., Gangsta Rap and West Coast Hip Hop, a group and set of music sub-genres that changed the face of music forever, making Dr. Dre (real name: Andre Romelle Young), Ice-Cube (real name: O'Shea Jackson) and Eazy-E (real name: Eric Lynn Wright) big stars. (Arabian Prince (Kim Renard Nazel) was the other original member and they were later joined by DJ Yeller (Antoine Carraby) and MC Ren (Lorenzo Jerald Patterson). Eazy-E, wonderfully played by Jason Mitchell, formed the group and started Ruthless Records. They pressed and marketed their first song "Boyz-n-the-Hood" themselves. The popularity of that song brought the group to the attention of Jerry Heller (Paul Giamatti) who, seeing their potential, became their manager and brokered their first album, "Straight Outta Compton" with Priority Records, a company whose biggest star at that time was the California Raisins. The album took off and the band toured amidst many protests about the language and content of their music. In Detroit, a riot ensued when they played their song "F**k the Police," after the police security detail specifically told them not to. They were arrested but that only served to heighten their "gangsta" image and popularity. The guys enjoyed the money and the glamour, but as these things do a rift formed in the band. Ice-Cube (played by O'Shea Jackson Jr.) became suspicious of Heller's business practices and his seeming favoritism toward Eazy and acrimoniously left to pursue a solo career. Likewise, Dr. Dre (Corey Hawkins) eventually questioned the money and joined forces with Suge Knight (R. Marcos Taylor) to form Death Row Records where he produced records for up and coming rap stars Tupac Shakur and Snoop Dogg. Left on his own without Ice or Dre, Eazy started to unravel and realized Heller did not have his best interests at heart and his health deteriorated. But he was eventually able to make up with Ice-Cube and Dr. Dre and they all start talking about reviving N.W.A. Alas, that was not to be. You don't need to be a fan of rap music to enjoy this film. This has all of the same elements as some of the best biopics about bands ("Love and Mercy," "Jersey Boys"). The band forms in someone's garage, the band cuts a record, the band makes it big, then the band falls apart, one of the members hits the skids and then they all reunite. That is not to make light of the power of this film or the environment that produced N.W.A or the impact the group had on the music world. It's to say that this film is a classic. It has the power of "everyman," or should I say "everyband." Everyone can relate to these guys and their drive to "be somebody." They were no different from any young guys wanting to be creative and have some power in life, except they were young black men trying to make it in a world punctuated by the beating of Rodney King and L.A. riots. This was a time when my kids were teens and pre-teens and though they were young suburban white kids, they embraced the music because this music was new and loud and shook the walls of propriety. We Baby Boomers had Jimi Hendrix and The Doors. My kids had Ice-Cube and Dr. Dre. And now I finally know the lyrics they were listening to. Yikes. 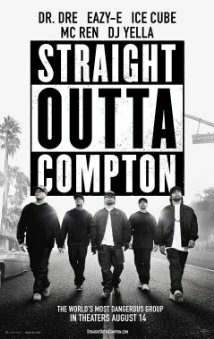 Directed by F. Gary Gray, with an outstanding script by Jonathan Herman and Andrea Berloff and produced by Dr. Dre, Ice-Cube and Eazy-E's widow Tomica Woods-Wright, this is an engrossing recreation of the times that inspired gangsta rap and it pulls no punches. The young actors are brilliant and uncanny look-alikes of the real artists, which is particularly no surprise for the Ice-Cube character, since he is played by the real Ice-Cube's son. The music and performances are right on and the set decoration creates the world that grew N.W.A. Rosy the Reviewer says...another great biopic and another Best Film of the year for me. Six friends in Tel Aviv record a song on a mobile phone and find, to their shock, that it is the Israeli entry in the UniverSong Competition. A group of friends are obsessed with the UniverSong competition, a sort of "Israel's Got Talent" and Eurovision combo. They get together every year to watch the competition together. When Anat's love leaves her, the friends write her a song to cheer her up. The song gets entered in the UniverSong competition and starts to get a lot of press. None of them really wants to do it but eventually each comes up with a reason to venture outside their comfort zones: Kerin, the timid blogger; Anat, the baker and mother whose husband left her; Efrat, the aspiring musician; Yael, the former beauty queen turned lawyer; Dana, the overworked political aid; and Ofer, a gay kindergarten teacher with a closeted boyfriend. The UniverSong (based on the popular Eurovision contest) competition seeks the most popular song from across the globe and the various countries vote. So even though the friends are reluctant to do this, the UniverSong machine kicks in trying to mold them into an ABBA-like group (ABBA won Eurovision), but eventually they realize they are being exploited and not being true to themselves. 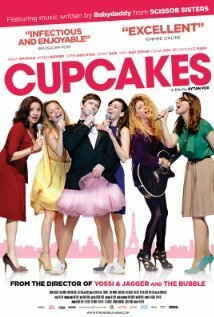 This is a musical comedy with fun songs and performances that is as sweet a confection as, well, cupcakes, but not sickeningly so. The soundtrack uses songs that have won Univision contests in the past including the freakish American win one year with "You Light Up My Life." This is director Eytan Fox's satire on Eurovision. Fox is a celebrated Israeli director who was born in New York City but moved to Israel when he was two. Eurovison is not very well-known to American audiences but it is a big deal in other countries. Fox remembers his family and friends gathering together to watch when Israel first entered in 1973. This is his take on remembering what it used to be like in Israel when neighbors all knew and helped each other. He laments that it's not like that in Israel anymore. But this is also a statement on how silly the Eurovision competition has become and how when something is sweet and pure (cupcakes), it's not long until someone tries to pervert it for their own gain. Rosy the Reviewer says...this is feel good movie about the power of friendship. If you liked "Mama Mia," you might like this. Mr. Jonathan (Ben Miller) is a politically active dance teacher who wants to do something important with his dance troupe but he also wants to win the Sanosafe Troupe Spectacular competition. Mr. Jonathan has interesting ideas about how to choreograph meaningful dances. He wants to highlight political causes so in rehearsal he asks his girls how they would move if they were enslaved by a multinational corporation or if they were ants being oppressed and forced to make sneakers. You get the idea. His biggest competition is Miss Elizabeth (Jane Hall) who wants to win at any cost. She's not quite Abby Lee Miller but close and, yes, there are Dance Moms, one particularly obsessed with her daughter winning. Justine (Kerry Armstrong) is living out her own dance ambitions through her daughter, Tennille. Other pushy Moms bribe judges and go to outrageous lengths for their children to get ahead. These Dance Moms make the "Dance Moms" on TV look like saints. The office manager (Denise Roberts) for Mr. Jonathan's dance school runs the Happy Valley Foster Home and decides who to foster by whether they can dance or not and the mostly mute goth costumer, Marianne (Tara Morice), has some questionable ideas such as employing a gas mask on one of the children that makes her pass out. Mr. Jonathan can't stand that Miss Elizabeth keeps winning all of the competitions with her standard routines, in his eyes, boring and meaningless. He decides that his winning piece will be about Afghan women under the Taliban, not a popular idea with the Moms. Mr. Jonathan's bid to win is being filmed by a documentary crew so we are in mockumentary mode in the Christopher Guest tradition. Think "This is Spinal Tap," meets Australian Dance Moms. We see the rehearsals, the preparations and the private moments as they prepare for the big competition. 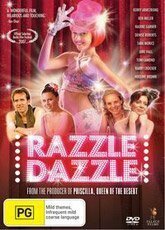 This is a funny faux documentary written and directed by Darren Ashton, and it's a biting but delightful send up of dance teachers and competitions. It's the age old story of the underdogs overcoming adversity to win but in a fun way. Rosy the Reviewer says...if you are a Christopher Guest fan and like "Dance Moms" or "So You Think You Can Dance," you will love this little film. Five college students travel to a cabin in the woods of Tennessee only to discover their little vacation involves demons. A shaky camera moves ominously fast across a swamp and a forest floor. Next we see five college students - Ashley (Bruce Campbell), Scotty, Cheryl, Linda and Shelly in a car singing and kidding around and wearing really terrible early 80's clothes. We know they are college students because one of them is wearing a sweatshirt that says "Michigan State." As they head to the cabin, they cross a bridge with a sign that says, "Dangerous Bridge," and one wheel of the car sinks into the weak boards of the bridge. Not a good sign. Either is the ominous music. They make their way down a heavily wooded road accompanied by eerie music until they get to a rundown cabin where a porch swing is banging against the wall of the cabin. They struggle to find the keys to open the door. "Don't go in there!" (That's me talking to the screen from my armchair). They inspect the cabin and settle in for the night but not before a clock stops working, a strange force takes control of one of the girl's hands while she is writing and a trap door starts to open by itself. I would say those are all things that would make me say, "Time to leave." When the door to the cellar opens to the sound of symphonic music and cymbals, one of the guys decides it's a good idea to go down there. Huh? "Don't go down there!" (Me again). But of course he does. When he doesn't come back, Ashley goes looking for him and encounters a closed door. "Don't go in there." (I can't help it). But of course he does. Turns out Scotty has found a recording of a past occupant of the cabin, a professor who was studying "The Book of the Dead." 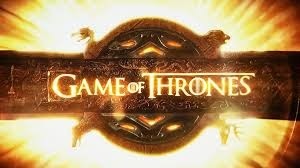 They play the recording and the professor says in the recording that his wife had become possessed and then he recites an incantation. Well, folks, that incantation was not good. All hell breaks out now as one by one, the students turn into demons and make Ashley's night a living hell. Horror films work on our basic fears: dark basements, locked doors, the occult, unexplained noises, thunder and lightning, fog, dark woods - and it's all here along with incredible blood and gore. However, there is a scene where one of the girls is raped by a tree and that doesn't really fall into my basic fears category. In 1979 a group of Detroit friends raised $375,000 to make a horror film about five college students possessed by demons. They wanted to make a film that was "the ultimate experience in grueling terror." I'm not so sure about the terror part because it was so over the top it was laughable at times, but it was certainly gory. Stands as one of the early "Don't go in there" films that inspired others. Why it's a Must See: "This 'ultimate experience in grueling horror,' as it immodeslty bills itself in the end credits, changed the history of its genre. 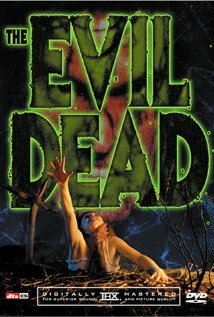 Sam Raimi took the gore of Italian horror movies and mixed it with a proudly juvenile sense of humor -- making its teenage heroes so vapidly wholesome that we cannot wait...for them to die or be zombiefied. Such self-consciousness would subsequently come to dominate screen horror...Today, it is hard to see anything but comedy...but we must remember that in 1982 the film had the same terrifying effect on audiences as The Blair Witch Project seventeen years later..."
Rosy the Reviewer says...girls as ghouls and gratuitous gore. Glorious. If you liked "The Blair Witch Project," this one is kinda like that so you might like it, but again, this one is very campy and very gory. A food blogger with an unhappy childhood seeks to cook a meal from every country in the world as a way to heal. Growing up with an eccentric mother who eventually couldn't take care of Martin and her brother, Martin lived in a series of foster homes and eventually under the guardianship of her mother's friends, who moved to Europe, where Martin spent her formative years. She did not adapt well to her new family and changing environments, and when a tragedy entered her young life, it fell apart. But the one thing that was a constant was her memories of cooking with her mother and her love of food. Later in life when she had reconnected with her mother, but was at loose ends after the birth of her child and haunted by her past, seeing the movie "Babette's Feast" and a gift of spice jars from around the world gave her the idea to cook food from every country in the world. She embarked on that journey, eventually starting a popular food blog, "Global Table Adventure." She gained some peace from that, learning to reach out and enjoy a sense of community. "Though I may not have secured a new future, I'd secured something much better by filling those empty spice jars nearly four years ago. Cooking the world has opened my eyes to other ways of being, loving, and mothering. Most importantly, it has taught me to savor the present moment...There's an ease to not knowing what will come next -- an ease I never could have felt before." This book joins the many with recipes interspersed among the text. However, what sets this apart is her quest to prepare and eat a meal from every country and sharing many of those recipes. "Kabeli Palau" from Afghanistan; Bulgarian "Kompot;" Samoan Chocolate & Orange Coconut Rice Pudding." She shares her search for the sometimes strange ingredients and her successes and failures with the recipes. That quest and blogging about it helped her to express herself and to heal her sadness and regrets about the past and is the strongest part of the book. Unfortunately, it doesn't start until two-thirds of the way through. I hate to say it, but some of the earlier parts of the book lumber a bit under Martin's rather slow-paced and sometimes melodramatic narrative. However, I totally relate to her project and how her blog helped her at a time of change and stress. 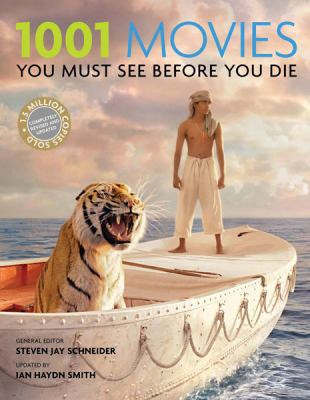 My blog has also helped me as I make my way through my "1001 Movies I Must See Before I Die Project" and this strange realm called retirement. 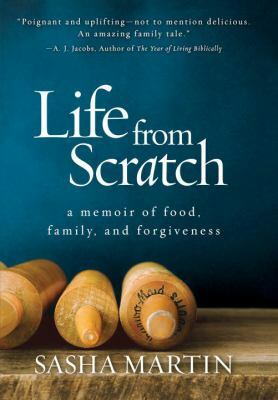 So this is a strong entry in the memoir plus recipes genre and the self-help world of food as healer. Hopefully it will spur others to find an interesting project that will help them express themselves and find a sense of community and peace. Rosy the Reviewer says...if you like your memoirs with recipes, you will probably like this book. Now stop me before cooking my way around the world becomes my next big project! I am not sure I would have seen "Straight Outta Compton" if I had not read this. I was born and raised with classical music with maybe a smattering of 60's music when I was young. The Rap thing totally escapes me except maybe for the beat. BUT now I am interested in the social and political aspects of the movie thanks to your review. I think I will wait tho for the dvd. Definitely adding the book to my long list of holds at the library.